Smoke rises from a fire burning at the Intercontinental Terminals Company in Deer Park, east of Houston, Texas, U.S., March 18, 2019. Jaimie Meldrum/@jamiejow/Handout via REUTERS . HOUSTON: A raging fire at a petrochemical storage terminal in Houston has engulfed two more massive tanks after firefighting water pumps stopped working for six hours, the company said on Tuesday. 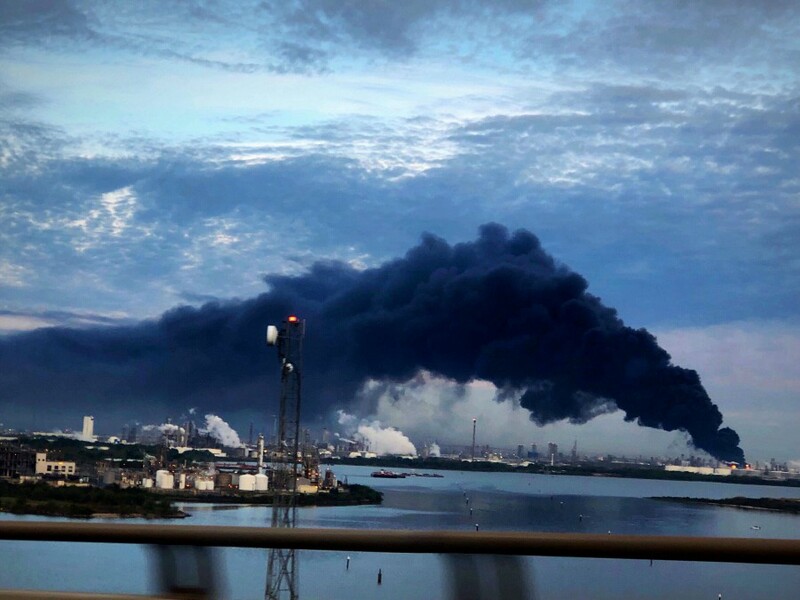 The blaze at Intercontinental Terminals Co (ITC) in Deer Park, Texas, has been burning since Sunday when a leaking tank containing volatile naphtha ignited and quickly spread to other tanks within close proximity, the company said. The storage terminal on the Houston Ship Channel, the nation’s busiest petrochemical port, is home to nine refineries and petrochemical storage and loading facilities. Pumps on two boats feeding water to firefighters malfunctioned for about six hours, ITC spokesman Dale Samuelsen said. That allowed the fire to spread late Monday to the two tanks, one empty and the other containing toluene, a volatile liquid used to make nail polish remover and paint thinner. ITC, which is owned by Japan’s Mitsui & Co, said it will bring in high-pressure pumps Tuesday morning to help firefighters trying to contain the inferno within the area of 15 closely spaced tanks. The company said on Monday the fire, which has spewed thick, acrid smoke that is visible dozens of miles away, could burn until Wednesday. Samuelsen said he had no new timetable for when the blaze will be extinguished. He said the burning tanks are within an earthen berm that is collecting water and chemicals leaking from the tanks.